Reach level 7 of your ancestral, procedurally generated, and radioactive tomb. As you spend time in the dungeon, or engage with radioactive enemies, the green bar at the bottom of the screen will show the accumulated radiation in your body. When it fills up, you might experience health problems. Pick up blue Energy Balls to flush out the radiation from your body and heal afflictions. There's also a chance it will give you a buff. Bump into enemies to attack them. Enemies move after you've made your move. Enemies can't walk on top of each other, but bats can fly over other enemies and occupy the same space as them. When tomb bots die, they explode. Move away from the explosion to avoid damage. 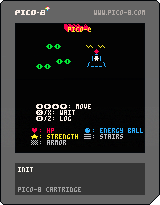 This is a PICO-8 roguelike made in 7 days. I didn't have too much time to make it interesting, but I made everything from scratch and learned a lot, and I also got some ideas for a larger game (realistically, next 7DRL). This game uses the 16-color PICO-8 palette and the lively 4x6 PICO-8 character set, in an attempt to make the equivalent of a traditional ASCII roguelike on the PICO-8. There are no sprites in the game. Enemies will not follow you when you enter corridors. This is a very unfortunate problem, but at least it can either be a problem (they might be waiting for you when you exit a corridor) or an advantage (you can safely attack enemies from a corridor). The game is probably poorly balanced.